In the upper Wensleydale near Burtersett, the River Ure flows slowly, winding in the broad floor of the valley. There is a magnificent view of Wensleydale around here. The hill over the opposite bank, in this picture, is Abbotside Common, 2218 feet high. 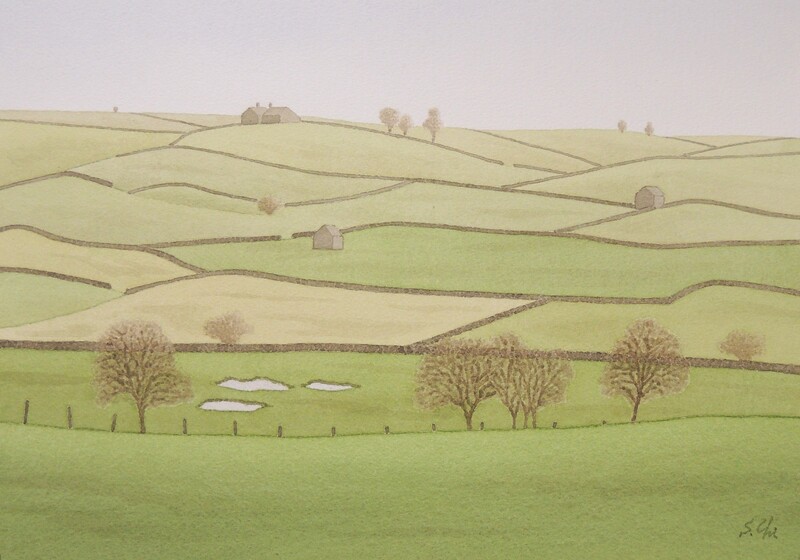 Another side of it is the upper Swaledale. There are old villages of Gayel and Hawes. The origin of Gayel, a centre of cheese production, is said to go back to the times of the Celts. Duerley Beck flows beautifully in cascades over limestone beds beside the old stone houses. Hawes had been a capital of upper Wensleydale and is the highest market town in Yorkshire and the second highest in England. The highest market town in England is Alston, in Cumbria. Both of them are 1000 feet, more or less, above sea level. From these facts I can understand that England is very flat compared to Japan. 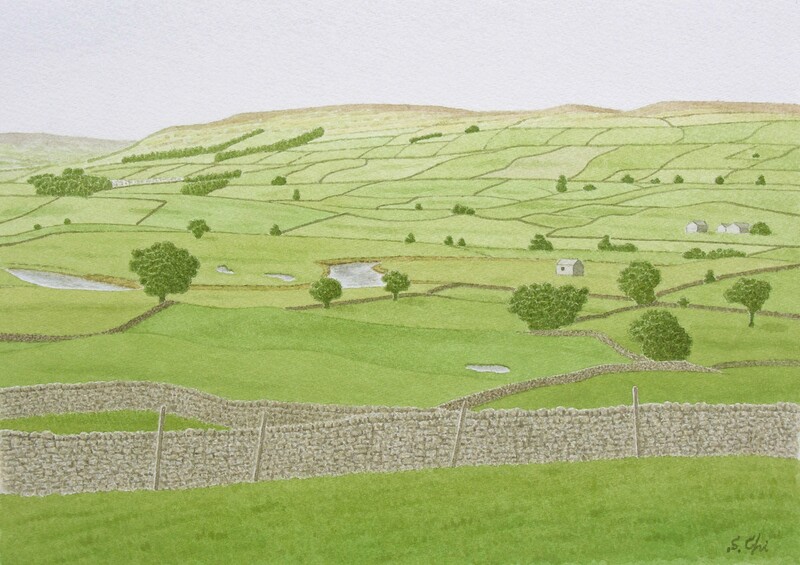 The name of Hawes which is surrounded by mountains comes from the word "haus" meaning a mountain pass in Anglo-Saxon. I heard Hawes is the home of the "King of Wensleydale", Kit Calvert. During the World War II, when cheese had been rationed, Wensleydale cheese was classed as a second grade one because of lacking in acidity and being too wet. Further, it was found to be more economical to sell the milk as milk. This hurt the pride of Yorkshire so deeply. When the war ended, the technique of making Wensleydale cheese had been almost extinguished. It was Kit who revived the cheese industry and dalesman's pride. Being a man full of energy and an industrious man, Kit recorded and studied the Dales dialect, into which he translated the Gospels. There is a similar story in Japan. Harutugu Yamaura, a Catholic, was born in Tokyo in 1940. He grew up in Ofunato of the Kesen district, Iwate prefecture and became a physician there. The district is a small one of the north of Honsyu, the main island of Japanese Isles. Yamaura recorded and studied the dialect of Kesen district and built up them as "Kesen-go", which means literally the "language of Kesen". Then he compiled the dictionary of Kesen-go in 2000. Furthermore, he translated the Gospels from the Greek original into Kesen-go. He was good at Greek. This is not the end of the story. He expressed the pronunciation of Kesen-go in Latin. Very honourable for him, Yamaura could present the four-volume Gospels to the Pope directly in 2004.